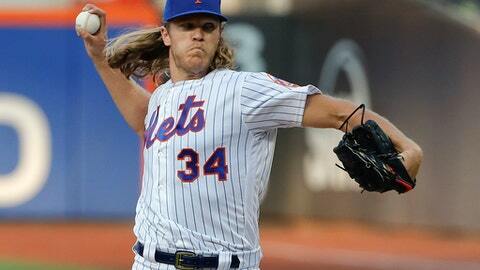 NEW YORK (AP) Noah Syndergaard was back on the mound for the New York Mets and made it clear he wants to stay. With his name bandied about in trade talk ahead of the July 31 deadline, Syndergaard pitched out of trouble during a rusty return from the disabled list and helped himself with an RBI single as New York beat the Washington Nationals 4-2 on Friday night. ”If they wanted to trade me tomorrow, I really have no say in what they do,” Syndergaard said. ”I can’t say it enough – love my time being a New York Met. I love the city, I love embracing it, I think they’ve embraced me. Amed Rosario tripled and doubled, both times over Bryce Harper’s head in center field, and the Mets won for only the sixth time in their last 26 home games. Brandon Nimmo had three hits for New York, which built a three-run cushion in the first inning against struggling starter Tanner Roark. Matt Adams homered for the inconsistent Nationals, who went 1 for 12 with runners in scoring position and fell back to .500 at 47-47. After missing seven weeks with a strained ligament in his right index finger, Syndergaard (5-1) came out firing 99 mph fastballs. But he gave up seven hits in five innings and never retired the leadoff batter. Still, the 2016 All-Star held the Nationals to one run while striking out three and walking two. Wilmer Difo made things easier on New York by running into the first out of the third inning at third base. Syndergaard then retired Anthony Rendon and struck out Harper with two on to limit damage. Difo had doubled to drive in Roark, who opened the inning with the first triple by a Washington pitcher since Joel Hanrahan in 2007. Syndergaard also got Harper to ground into an inning-ending double play with two aboard in the fifth. Perhaps frustrated after hitting the ball hard right to Rosario at shortstop, Harper didn’t hustle down the line. Syndergaard, making his first major league start since May 25, was pulled after 75 pitches. The right-hander threw 71 in a rehab outing Sunday for Class A Brooklyn. Seth Lugo overcame a wild start to his relief outing and worked two hitless innings. Robert Gsellman gave up Adams’ second-deck shot in the eighth but got six outs for his fourth save. Roark (3-12) settled in after a rough start but allowed four runs and eight hits in five innings. He and Baltimore right-hander Alex Cobb are tied for the most losses in the majors. Roark has lost his last five starts and is 0-6 since beating Tampa Bay on June 6. Washington has dropped his past seven starts and nine of the last 10. Jose Bautista and Devin Mesoraco each had an RBI single in the first, sandwiched around Wilmer Flores‘ sacrifice fly. Rosario tripled off the center-field wall to open the second and scored when a smiling Syndergaard lined a single to right field. ”I think I surprised myself a little bit,” Syndergaard said. Nationals: RHP Koda Glover is scheduled to pitch Saturday for Class A Potomac after his rehab assignment was moved up from the rookie-level Gulf Coast League. The reliever has been sidelined all season by right shoulder tendinitis and will probably require eight or nine appearances before he’s ready to come off the disabled list, Martinez said. Mets: OF Yoenis Cespedes (right hip flexor) ran the bases at the team’s complex in Florida and was scheduled to do so again Friday, according to Callaway. ”He came out of it really good. He feels good and is progressing,” Callaway said. Cespedes has been out since mid-May. … LHP Jason Vargas (strained right calf) is set to make another rehab start for Brooklyn on Saturday. To open a spot for Syndergaard, the Mets optioned LHP P.J. Conlon to Triple-A Las Vegas. Nationals RHP Austin Voth makes his major league debut Saturday against Zack Wheeler (2-6, 4.42 ERA) and the Mets. The 26-year-old Voth, a fifth-round draft pick in 2013 out of Washington, was 4-5 with a 3.55 ERA at Triple-A Syracuse. Wheeler, pitching in some poor luck, is 0-5 over 13 outings since his last win April 29 at San Diego. That’s the longest stretch without a win for a Mets starter since 1998. The right-hander is 2-8 in 11 career starts against Washington, including 0-6 with a 5.71 ERA in six games at home.